We are a rural community and the aim of Music in Ulpha is to provide an evening of quality entertainment for people of all ages. Our catchment area is the area of Broughton-in-Furness and the Duddon Valley but we also attract people from all over Cumbria and as far as Lancaster and Preston. Also we are a popular holiday location so we get "guests" when they are staying in the area..
We are well supported and ages range from 8 to around 80 years old. 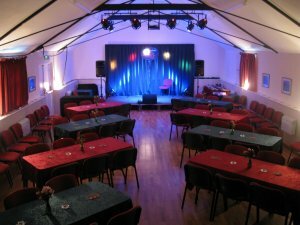 For our musical evenings, we like to present the hall in a friendly caberet style with a maximum seating capacity of about 80 with 75 ticket payers. There are no dedicated changing facilities, however between setup/sound check and the performance, light refreshments or a meal and changing facilities are available a short drive away. See below. We have a licensed bar that we close during the performance. There is a modular stage which has a backdrop screen and ample stage lighting. The PA comprises of a 20 channel mixing desk and 400 Watt powered speakers with bass bins, monitors and an experienced sound engineer. We have microphones, stands, DI boxes, etc. so can cope with most requests. There is a raffle at each event, the proceeds of which are for local causes. A CD as a prize is always appreciated. If necessary, bed and breakfast accomodation can be provided.